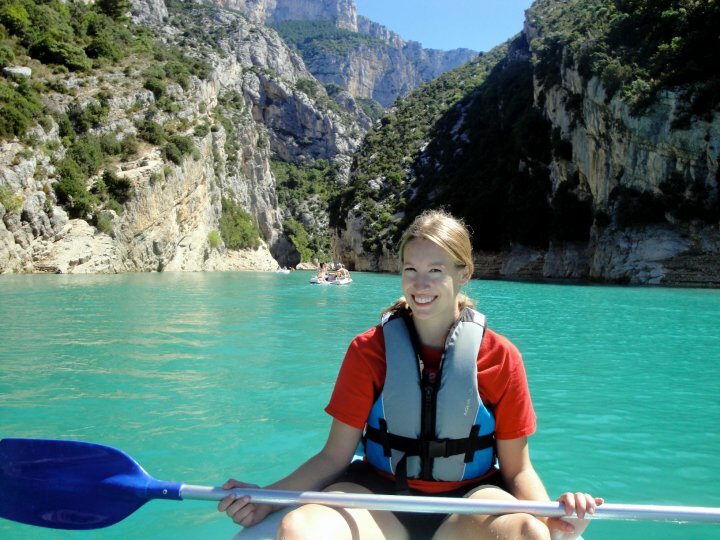 I had 2 really amazing days this past week – a kayaking excursion on Thursday and a trip to the Gorges du Verdon on Saturday! On Thursday, 7 other people in my group and I headed out to Palm Beach for some kayaking on the Mediterranean. We had a guide, named Adrion, who paddled along with us and made sure we were going the right way! He didn’t speak much English, but we managed to communicate pretty well. 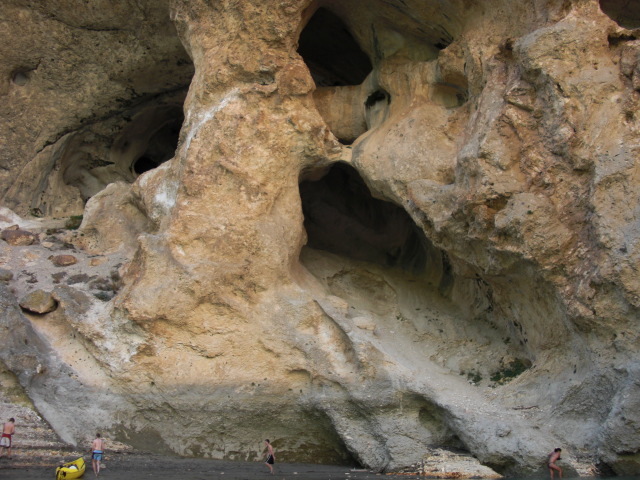 Shawn and I shared a kayak, and we paddled toward the Iles des Lerins – we stopped at a beach on Sainte-Honorat for some swimming and then paddled over to Sainte-Margarite. We explored the island a little bit – it was absolutely beautiful! And it was so nice to be out and the weather was perfect. Our troubles started on the way back. We had already been out for about 4 hours and we were starting to get hungry and the sky was getting cloudy. We started to head back, but it was much more difficult this time! The waves were much bigger and the wind kept blowing us off course. Poor Regina and Leah capsized under a huge wave! Luckily, they can both swim well and didn’t lose anything too important to the sea! We all made it back fine – sore, exhausted, and hungry but all agreed it was a blast and definitely worth it! :) Unfortunately, I didn’t bring my camera, so I don’t have any pictures. 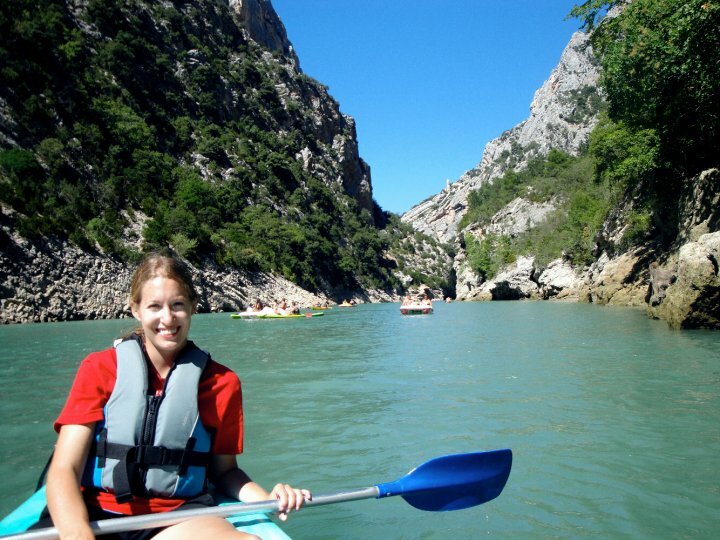 My second adventure was to the Gorges du Verdon. The Collège organized this trip, and Leah and I went along with about 20 other people on a bus. 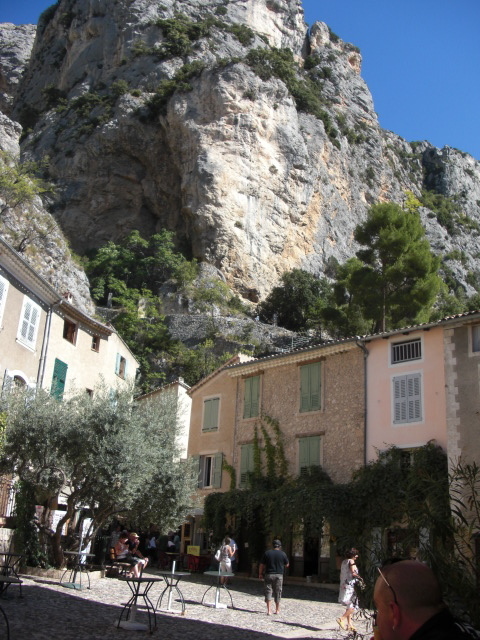 The bus made its way through the tiny winding roads for 3 hours up to the Gorges – a recipe for motion-induced nausea for me, so I was very thankful that I had taken motion-sickness meds before getting on the bus. 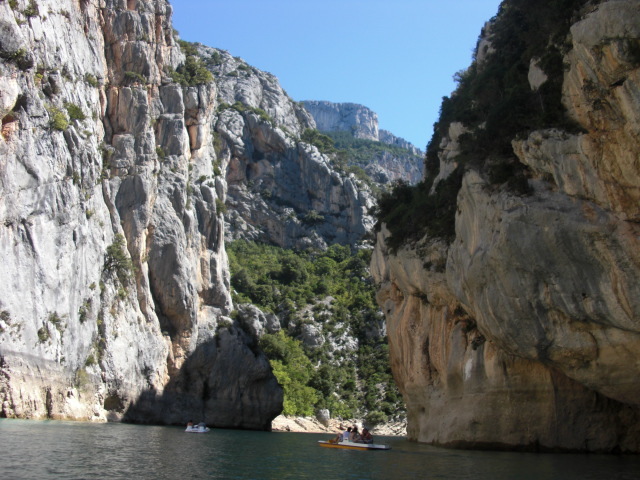 In any case – the stomach-churning bus ride was worth it for the amazing views of the Gorges! 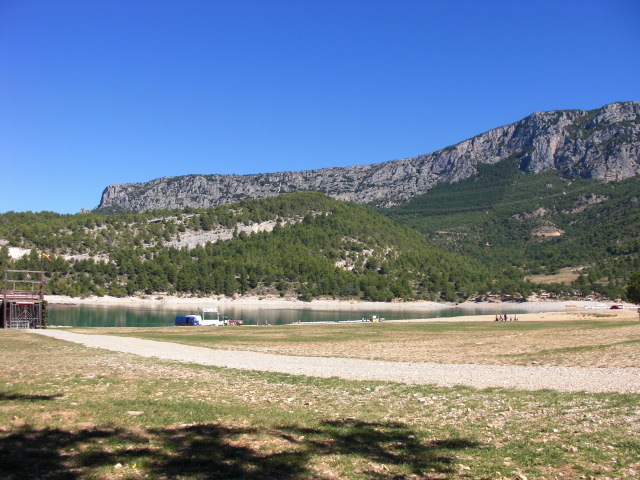 Leah and I had a picnic lunch before we headed down to the lake, Lac-Sainte-Croix. 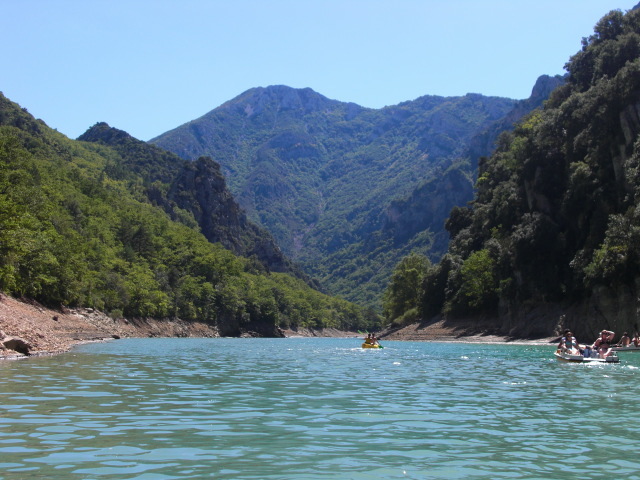 We rented a kayak and headed down the lake onto the river and into the Gorges. It was absolutely amazing! The Northern Minnesotan in me was so happy – it was incredibly peaceful and so refreshing to be out in nature and away from the glitz of Cannes. Who would have guessed I could find this in France, especially the Cote D’Azur? We kayaked for about an hour and a half, paddling with no rush, and taking the views. It was so difficult to get a picture that really appreciates how massive the Gorges are. Look down to the bottom of the picture and you can see some people. This picture only somewhat appreciates how big the Gorges are! 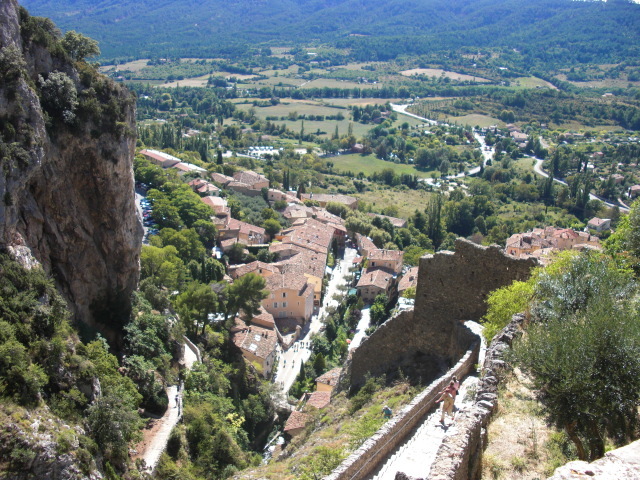 After the peaceful trip down the river, we headed to the nearby village, Moustiers-Sainte-Marie. It’s a very small town that is naturally divided by a small stream and a little waterfall, and it’s known for a particular kind of ceramic made there. It was very relaxing to wander through this village without an agenda, and to sit back and appreciate the blend of nature and history. Leah and I hiked all the way up to a tiny church near the top of the Gorges, and we could not stop taking pictures of the amazing views! Other than that, I have been settling into life here more and am getting used to the routine and slow pace of life. Another horde of Americans arrived the other day (about 40 students, who will be here for 2 weeks) so the school feels definitely American-dominated right now! I am starting to get a little more homework for classes, but I don’t mind because it is nothing compared to the normal workload back at St. Ben’s. 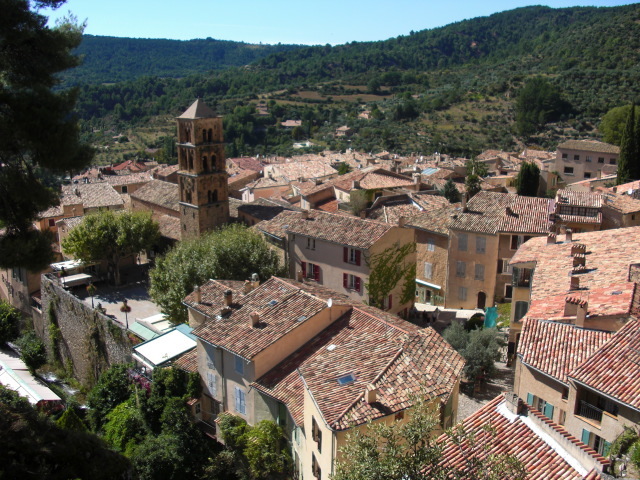 I am excited for this weekend – we will leave on Friday morning for our tour of Provence! We will be visiting Arles, Avignon, Pont-du-Gard, and Les Baux. I can’t wait!